We’ve been asking new email subscribers what their biggest frustration is in cooking for a small household. Want to know the #1 thing they struggle with the most? It’s finding the motivation to cook. I get it. Some days I just want to pour a bowl of cereal and call it dinner. Sometimes I do just that. Most nights though, when I don’t feel like cooking I use the following tips to motivate myself to get in the kitchen and make a meal. 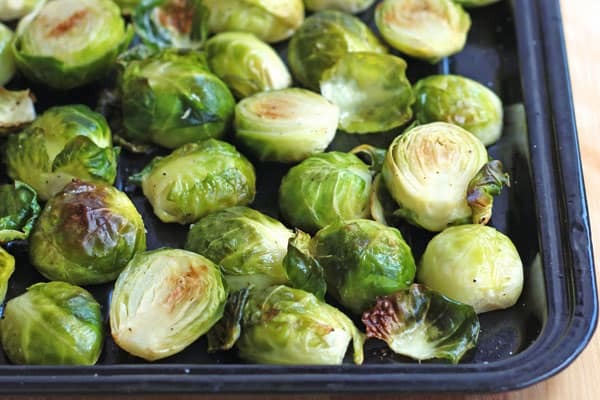 If you’ve always steamed Brussels sprouts, roast them instead. Sick of eating pasta? 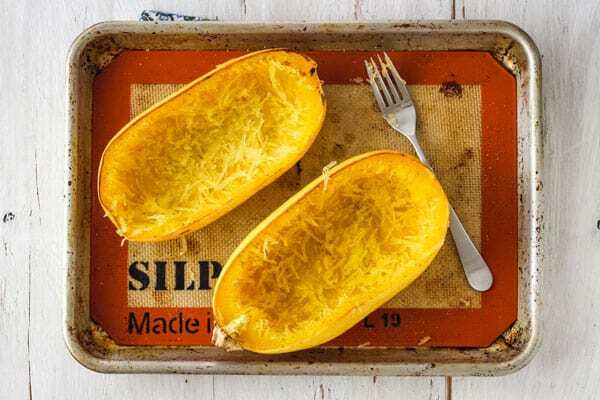 Swap it for cooked spaghetti squash or zucchini noodles. And what about the Instant Pot you bought on Black Friday that’s still in the box – it’s time to figure out how that thing works! As a life-long microwave user, roasted vegetables were a revelation. They taste sooooo good I wanted to roast ALL the veggies. 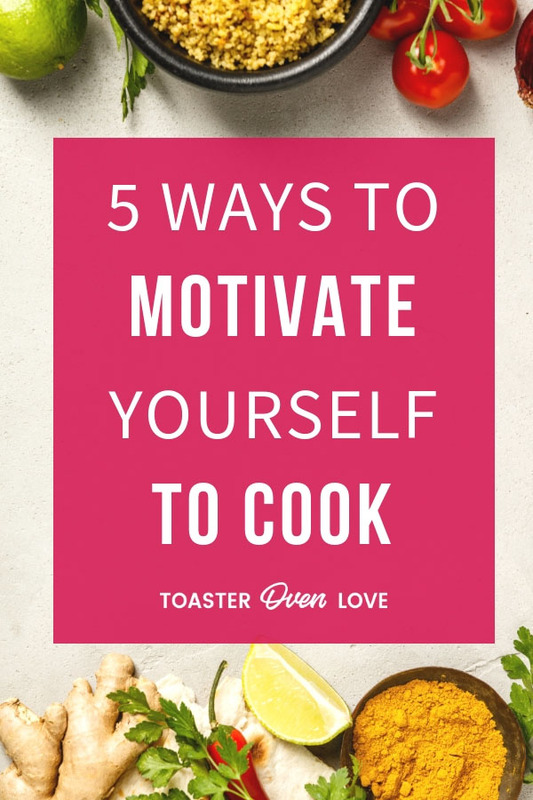 To keep my motivation going I used to buy one new vegetable every week and learn to cook it in our toaster oven. 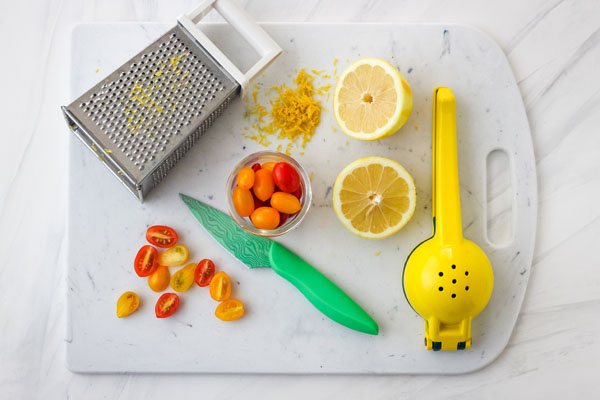 Exploring a different cooking method, moving outside of your veggie comfort-zone or trying a new recipe/kitchen appliance can be exciting. Even though I’m really excited about a new recipe the thought of prepping the ingredients sometimes feels like an overwhelming chore. If that’s where you’re getting stuck, put on fun music, a new audiobook, or your favorite podcast while you chop up those veggies. There are loads of free podcasts to choose from. Some of my favorites are Happier with Gretchen Rubin, Reply All, Armchair Expert with Dax Shepard, By The Book and /Filmcast. Trying one new recipe is fun. Cooking new recipes all week, not so much. Whenever I plan to cook a bunch of new and elaborate recipes the week always ends with a fridge full of wasted food. The accompanying feelings of failure, shame, and embarrassment are not motivating. If that sounds familiar, try to be realistic about the amount of time you want to spend cooking. Especially on weeknights. Things you’d be happy to eat (and cook) any time of the week. Ideally, you want recipes that are fast and/or simple. Meals that you can customize with different seasonings, toppings, dressings, and mix-ins (so you don’t get bored) go at the top of the list. 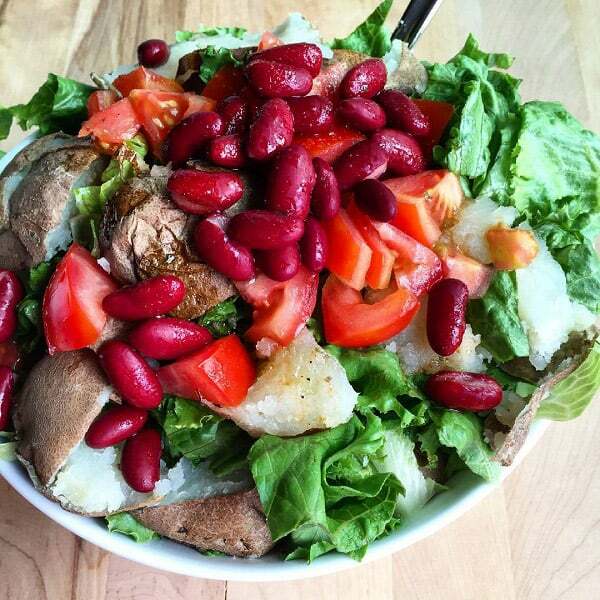 For us, that’s salads, quick baked sweet potatoes, veggie pasta, sandwiches, toasts, anything with eggs and my all-time favorite baked potato salad. Slap that list up on the fridge and every week shop for two or three of your go-to options. Then when you’re tired, hungry, and looking for motivation you can skim the list and throw together one of your favorite easy dinners. Right now, I’m fortunate to have Tim (my husband) to share meals with most nights. I happen to like him a lot and would prefer he sticks around for a very long time. 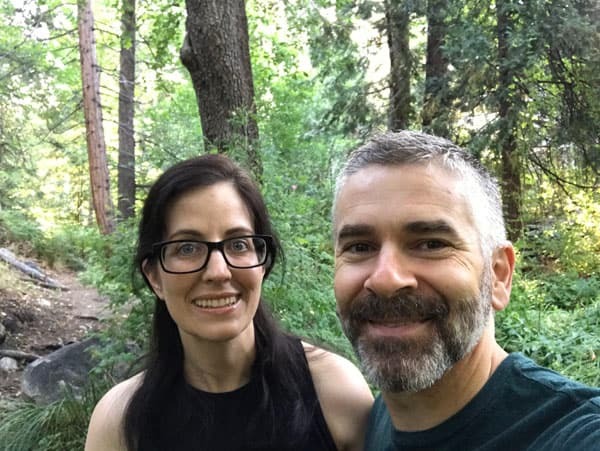 Avoiding fast food and eating nutritious meals keeps both of us feeling good, now and (hopefully) well into the future. That’s a HUGE source of motivation for me to regularly cook at home. Your body works hard for you every day. It deserves a good meal. 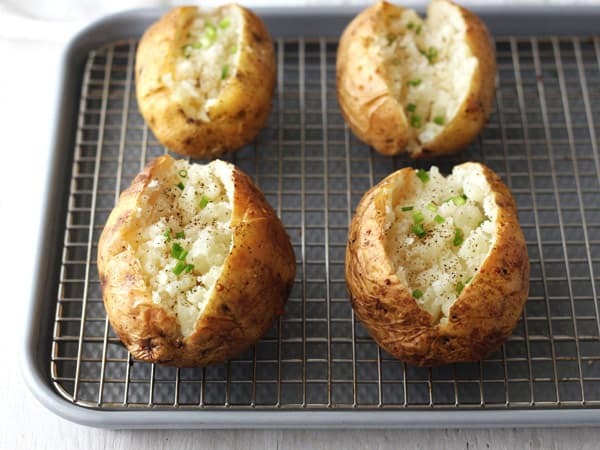 If you’re craving junk food – try and cook it yourself! I guarantee that anything you come up with will be better for you than what you’d get from the drive-thru. Need proof? 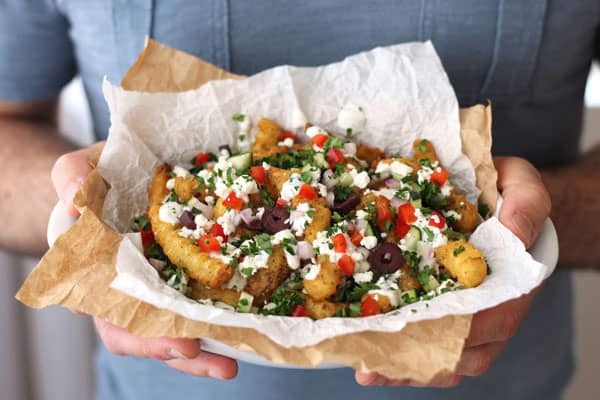 Check out these recipes for loaded fries for two, veggie nachos and roasted sweet potato rounds. While I’d love to make all of our food from scratch, that’s just not realistic. 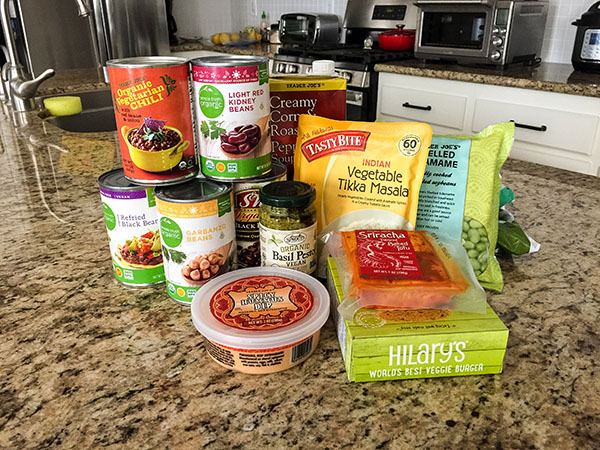 Keeping a box of your favorite shelf-stable soup, a stash of canned beans and pre-chopped fresh/frozen/canned vegetables on hand will lead to lots of mealtime inspiration and motivation. The other day we wanted something warm and hearty for dinner but I wasn’t feeling super motivated. I dug around in the pantry and fridge for a minute and came up with these ingredients. 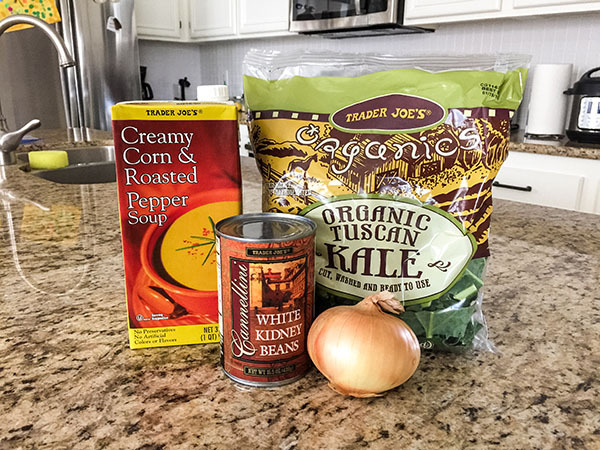 After sauteeing the kale with a little olive oil, half a chopped onion and some garlic I added the canned beans, a few red pepper flakes and then the soup. Less than 10 minutes later we were enjoying a super satisfying one-pot dinner full of quality protein and hearty vegetables. Not all packaged food is junk. There’s plenty of convenient good-for-you stuff available too. If you have trouble finding any motivation to cook during the week, meal prepping or once a month cooking might be a better option for you. Basically, you cook a bunch of food in one sitting and you’ve got premade meals for the week. 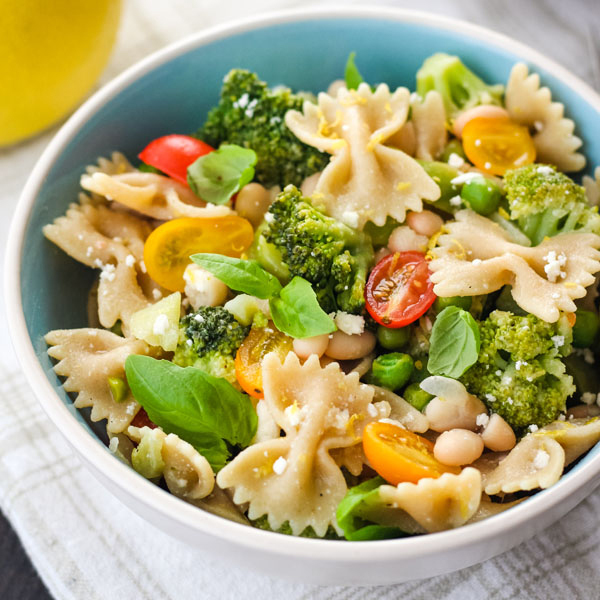 You can find lots of great vegetarian meal prep ideas here. Neither of us likes eating the same thing day after day so we meal prep a little differently in our house. On the weekends, I try to make just one thing ahead of time. 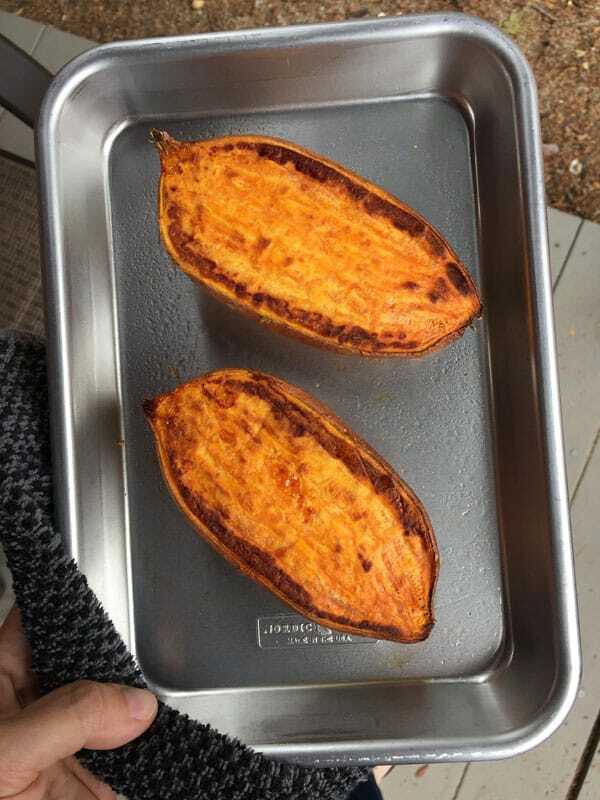 If you’re watching a movie, throw a batch of baked potatoes or spaghetti squash in your toaster oven or oven. The cooking process is almost entirely hands-off so it’s super easy. 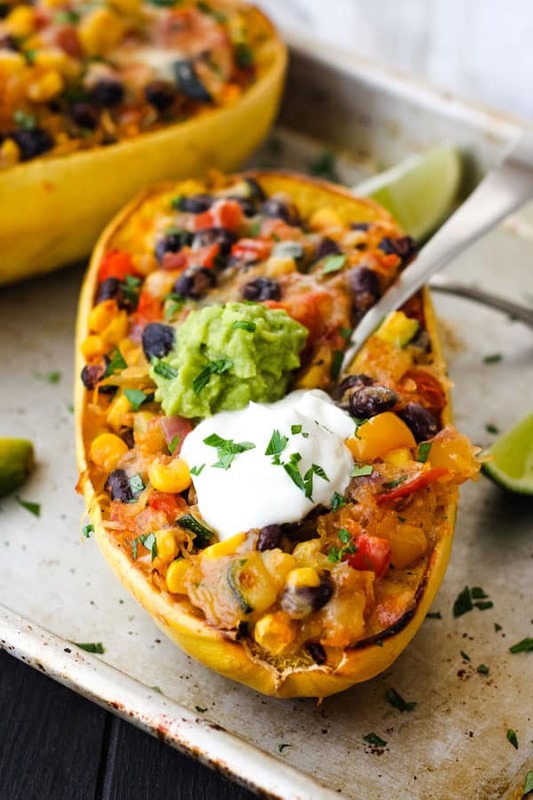 Then during the week when you open the fridge, you’ll be all kinds of excited to whip up a spaghetti squash burrito bowl or stuffed baked potato since half the work is already done. Or you can make a batch of quinoa to toss into salads or stuff a delicata squash with. Hard-boil a carton of eggs and your options are endless. For me, finding the motivation to cook just one thing is so much easier than trying to get psyched about cooking ALL the things. Lettuce sold by the head is fresher and usually cheaper than bagged salad. The trick to making sure you’ll eat the lettuce come dinner is to chop it in the morning before work. 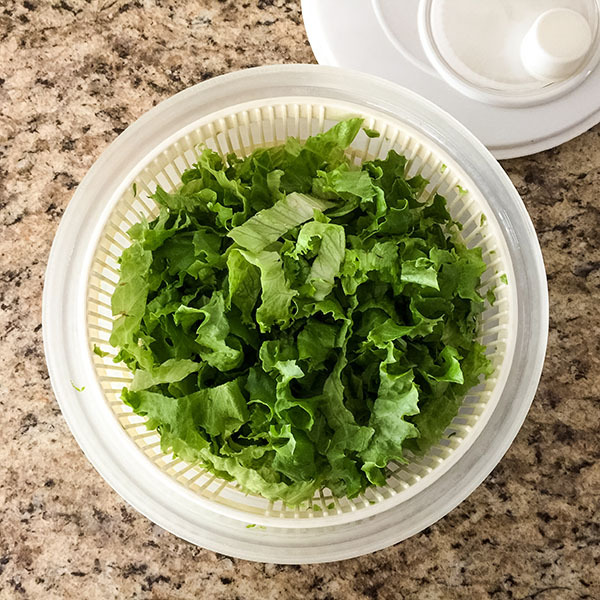 After you chop your lettuce, rinse it, spin it dry, and leave it in the spinner in the fridge. Then at 7 pm when you’re tired and hangry the lettuce will already be clean and you’ll be halfway to a fresh and tasty dinner-sized salad. For those times when life doesn’t go as planned (shocker!) and something comes up, I can usually get our lettuce to hang in there for one more day. Just give it a quick spin before bed and empty any water from the bottom of the container. Then pop it back in the fridge. It will stay fresh and crunchy until the next evening. And you don’t need a fancy spinner either, I grabbed ours at a yard sale years ago for just $1. This tip is super important and goes hand-in-hand with being realistic. 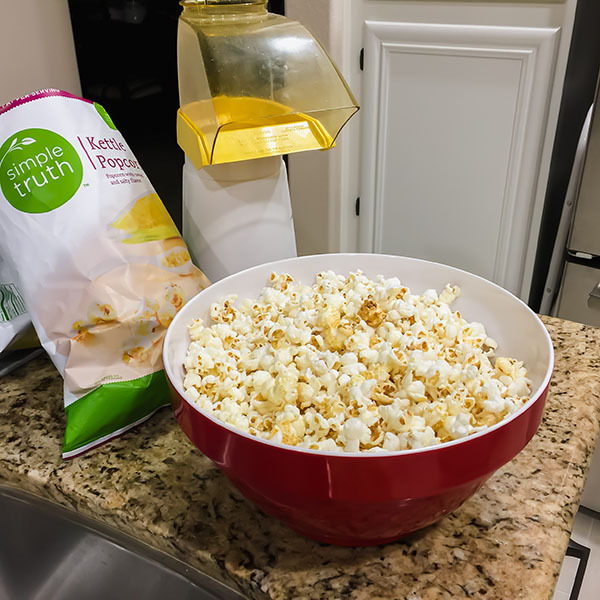 Every Friday night we use our air-popper to make a big bowl of popcorn, mix in a bit of flavored popcorn too (Kettle Corn’s my favorite) and call it dinner. It’s low-effort, lots of fun, and something I look forward to all week. Also, that tiny break from prepping, cooking, and cleaning up always gets me excited to hop back into the kitchen the next day and try something new. If ordering pizza or going out for sushi is more your thing, you do you! Creating good habits and taking care of yourself is a lifelong goal that doesn’t have a finish line. I stumble and knock myself off course all the time. Know that if things don’t go as planned, you haven’t failed. You get to try again: Every. Single. Day. Keep at it and don’t let that nasty thug named perfection be the enemy of your motivation to cook. What tips and tricks do you use to keep yourself motivated? Tell us all about them in comments. In season, I shop the farmer’s market. Then I have lots of lovely produce that must get used or wasted. And wasted is *not* going to happen. Yes!!! The farmer’s market is a great idea for getting motivated and discovering new fruits and veggies too. Thank You, Barbara! Your website and instant pot guides are the BEST. They’re so helpful and the #1 reason I’m no longer afraid to cook with our IP Mini.